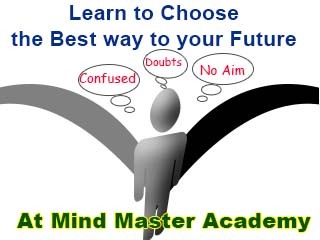 What are the criteria to get admission in various courses offered by Mind Master Academy? 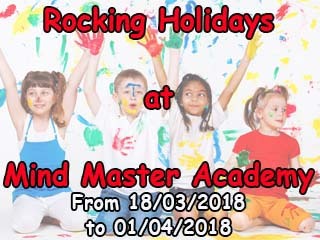 You can download forms online, fill it and come to Mind Master Academy, or you can directly go to the Academy ,get the admission form, ask your queries and get the admission. How to get the application form for different courses? You can either download from our website or get it directly from the Mind Master Academy's office. What all the things do I need for the admission? Do you have any entrance test? If yes how, when and where the exam will be conducted? No, At prsent there is no Entrance examination. Once it is planned to conduct, it will be notified through our website. What is the mode of fee payment? At present by cash or Cheque at the Reception of the Academy. How will you communicate the results? What is the medium of teaching in Mind Master Academy? Mind Master Academy is open from 6 Am to 9 Pm, and you can choose your convinient time. Do you give demo classes? Yes, we give demo classes. Do you provide your own study material for the courses offered by you? The study materials forn the courses offered by mind master will be provided by us. Do you provide feedback of students to parents? At present through telphone or direct. Soon it will be online, the parents and students can check the progress online. What are the other main facilities available at Mind Master? No. Hostel Facility Not Available.